"A traditional North American treat. Serve with jam or honey." Fry one at a time in 1 inch of hot shortening, turning to brown on both sides. Drain on paper towels. 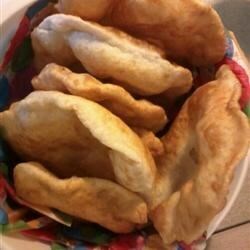 Fry bread is easy and fun to fry! We had to add extra water to it and it was really thick after cooking. Not as sweet as I am used to. This is as close as you can get to authentic fry bread unless you learn how to make it from a native american.